RUSH: For those of you watching on the Dittocam, hang on, because we’ve got some things we’re gonna show you on the Dittocam. Do you realize that — because of what we learned in the indictment — let me rephrase this so that you remember. The Mueller indictment clearly spells out how the Russians operated. They were not trying to help Trump. They were trying to undermine and sow discord about Hillary, who everybody thought was gonna win, including the Russians. Putin and the Russians hadn’t the slightest idea Trump was gonna win, and they weren’t trying to make Trump win, because there’s no way they could, as you will hear from yet another impeccable source in mere moments. What the Russians did was try to, through social media, sow discord about our whole system and cause people not to trust any of it, to turn on our democratic system, particularly elections. And the evidence is clear. Before the election, this Russian troll farm out of St. Petersburg was running all kinds of anti-Trump operations, much like Robert Creamer was running after having been paid by Hillary. Creamer was hiring a bunch of anti-Trump protesters and paying them to go to Trump rallies and cause trouble. Well, the Russians were posting ads and all kinds of things on social media urging people to show up at this anti-Trump rally or that. This is before the election. One week after the election, the same troll farm began promoting anti-Trump rallies. “He’s not our president” rallies. The Russians actually organized a massive “he’s not our president” rally one week after the election. And guess who promoted it? CNN. MSNBC. Michael Moore. These three and other leftist organizations became tools, useful idiots of the Russian troll farm. The Russians converted American news networks into agents, advancing their agenda of provoking discord in the American political system. And MSNBC and CNN had no idea that it was a Russian thing. They thought it was grassroots Americans. CNN and MSNBC both thought that this was real anti-Trump hatred and real anti-Trump protests. There were ads that were placed on social media. And these ads encouraged people to show up. And Michael Moore retweeted these ads. And CNN and MSNBC promoted these ads. Brian, let’s switch to that one right there. “Not my president.” Put this one on the Dittocam or switch it over there. This is a tweet. I took a screenshot of “Not my president.” You can see Trump there with a red X drawn through his face. This is a Russian sponsored rally and a Russian ad that was retweeted by Michael Moore, and the networks were all promoting this before it happened, all excited, CNN and MSNBC all excited this thing was happening. This is a Russian operation you’re looking at right there after the election. Everybody says the Russians wanted Trump to win, and that’s why they stole the election from Hillary. Not possible. Didn’t do that. They thought Hillary was gonna win. They were trying to undermine her before the election. Trump wins, they do a 180. Let’s put another one up. Put the next one up. That’s Moore at the rally. That is Michael Moore at the rally at today’s Trump Tower protest. “He wouldn’t come down. Here’s my Facebook Live coverage.” That’s a still shot. These all the people that the Russians caused to show up at the anti-Trump rally at Trump Tower. But they couldn’t have done it without the help of MSNBC and CNN who promoted it. They were so excited. They couldn’t stop talking about it. They thought it was grassroots American voters that were livid after the election. But it was a Russian social media campaign. We’ve got one more. Did I send you three or just two? Yeah. You got it ready to go? ‘Cause I don’t see it up there. 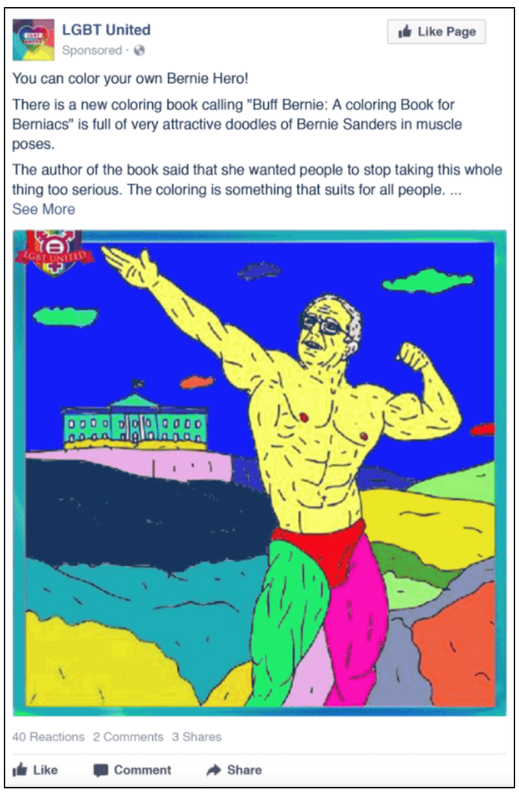 Put the Bernie coloring book on. The Russians were trying to help Bernie. That’s Bernie Sanders, and this is an ad that’s designed to create support for Crazy Bernie during the primaries and so forth. Does anybody think that ad is gonna make anybody think change their mind about how they vote? Is that ad gonna persuade anybody to change their vote for — no way. Now, for those of you not watching on the Dittocam, I apologize, but all of these graphics that I’ve just shown, we’ll put ’em on the website, RushLimbaugh.com, eventually on the free side so you’ll be able to see them. But it’s classic. This is what the Russians did, even after the election. RUSH: No. The big deal is that the media’s out there saying, “The Russians and Trump colluded. The Russians and Trump colluded!” And, meanwhile, here come the Russians promoting an anti-Trump rally, and the media is promoting a Russian attempt to sow discord in our politics. The media promoted it. It wasn’t just MSNBC and CNN. It was all kinds of other magazines. You had Slate.com, Mother Jones. The list is endless. They all promoted a Russian operation. They colluded! They, not Trump.